Situated in the vicinity of the Madanmohan Temple, Sridhara Temple is another historical masterpiece in Bishnupur, Manipur. The temple is only of its kind in the region, and thus, boasts a perfect example of Nava-Ratna variety of architecture. 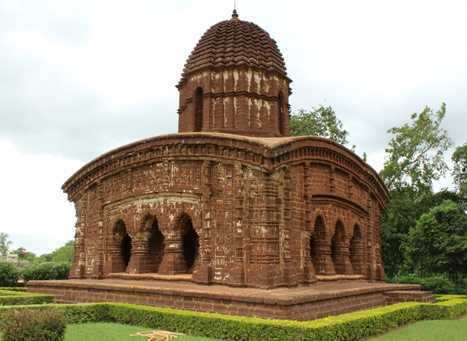 The temple was built the locals and has nine spires which entirely is considered as a major feature of this beautiful Hindu shrine in Bishnupur. Along with that, the gorgeous carvings on the walls of the temple is something that fetches a lot of eyes. These carving depicts the scenes from the epic Ramayana and Mahabharata. Besides, the episodes of Krishna Leela can also be seen through some of these carvings while some also show foreign soldiers holding guns. Amongst those numerous popular temples in Bishnupur, Sridhara holds a distinctive importance in the hearts of the devotees, and therefore, a significant footfall of both devotees and heritage lovers can be spotted here at this temple. In the whole region, Sridhara Temple is known for its unique architecture which includes a Nava-Ratna style - the nine spires. Because of these spires, Sridhara Temple stands out amongst their types in Bishnupur. Besides this, the interior and exterior of the temple are equally astonishing and are worth giving attention. The carvings and sculptures on the walls of the temple are something that lures a lot of tourists. Since the temple remains open for the whole year, and thus, one can visit it at any time. Despite this, the ideal to visit Sridhara Temple is early winter season to early summer season, from October to March. These months witness the most pleasant and comfortable weather that make it easy for travellers to explore local attractions during this time.